Also issued as Cash/silk 140cm in Fall 2009. The carre borrows its title from the ephitet “The man with wind for his soles” that Verlaine has used of his friend, the travel poet Rimbaud. It pays homage to Alexandra David-Neel (1868-1969), the explorer, versed in knowledge, who studies oriental philosophies and covered thousands of kilometers crossing Central Asia and the Far East. 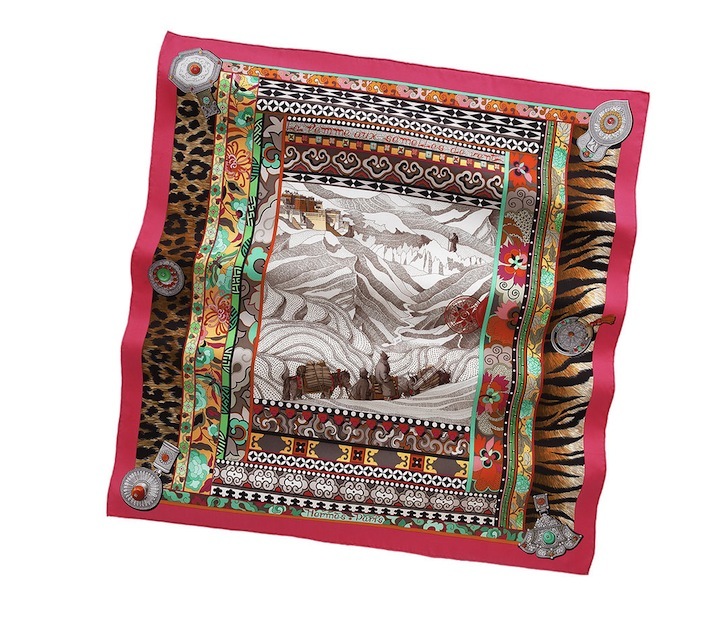 Like the rugs and clothing of these regions, the carre is bordered with fur bands, here printed on the silk, and embroidered braids, mixing ethnic, geometric or floral patterns, interspersed with pieces of gold-work, charms, and earrings of silver, coral and turquoise. Posted on Friday, February 3rd, 2012 at 2:29 am	under Carres - 2000s, Honore	.